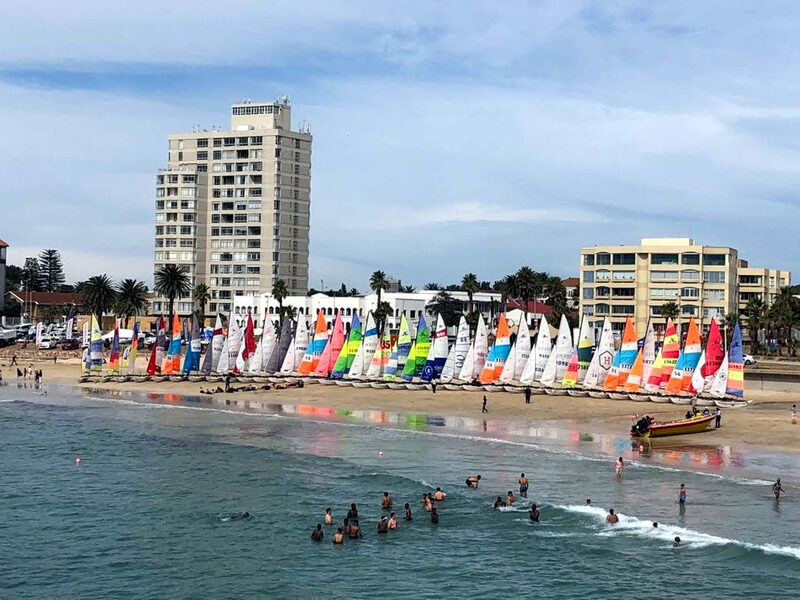 All the entrants in the 2018 Hobie 16 Nationals lined up on Hobie Beach. 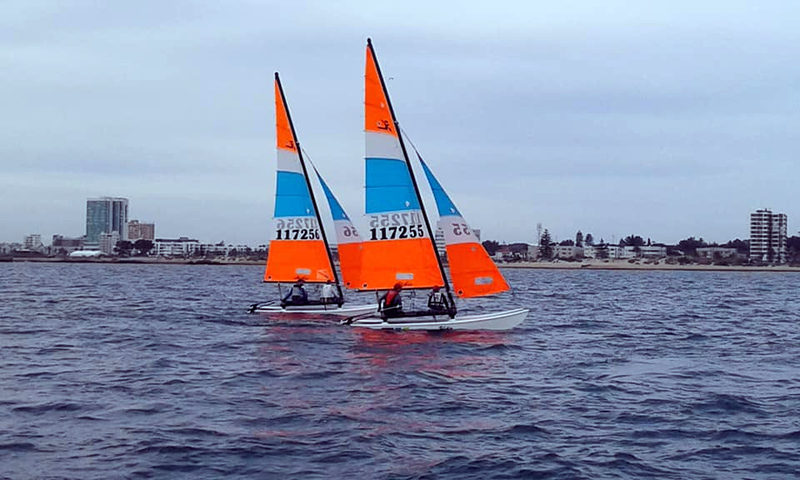 The 2018 Hobie 16 National Championships was held at one of its root venues in this country – Hobie Beach, Port Elizabeth. There was good participation of 34 from all parts of the country. On the first day, after the initial NW had eventually swung to the SE, the first race of the 2018 Hobie 16 Nationals got under way in very light breeze. But not without a general recall and the deployment of the U flag. Winner of this race was Sean Ferry/Lauren Pearce, ahead of Blaine & Roxanne Dodds. Third place went to visitor from Australia Paul Thomas, sailing with Thea Bierschenk. During this race, the wind was swinging to the south. The course had to be re-set for this direction for subsequent races, which were sailed in very light conditions. 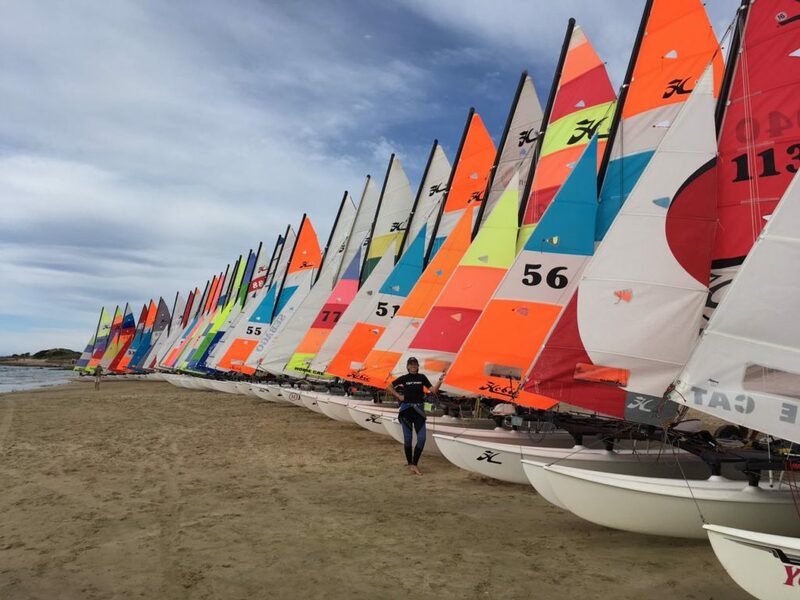 A colorful array of Hobie 16s on Hobie Beach, Port Elizabeth. Andrew & Ashley Bosworth won race 2 ahead of Paul Lagesse/Tyran Kerford, and William & Lucinda Edwards won race 3 ahead of Garth Loudon/Liam Fennesey. With such mixed performances, consistency put Lagesse/Kerford in the overall lead at the end of Friday’s races. 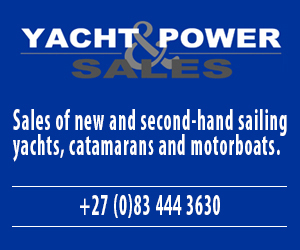 A gale force south westerly blew all day Saturday, precluding any racing. Racing resumed early on Sunday. Race Officer Doug Alison got proceedings underway at 09h00 in the light NW land breeze. Two races were completed in these conditions. Lagesse/Kerford won the first of these races and team Edwards won the second. 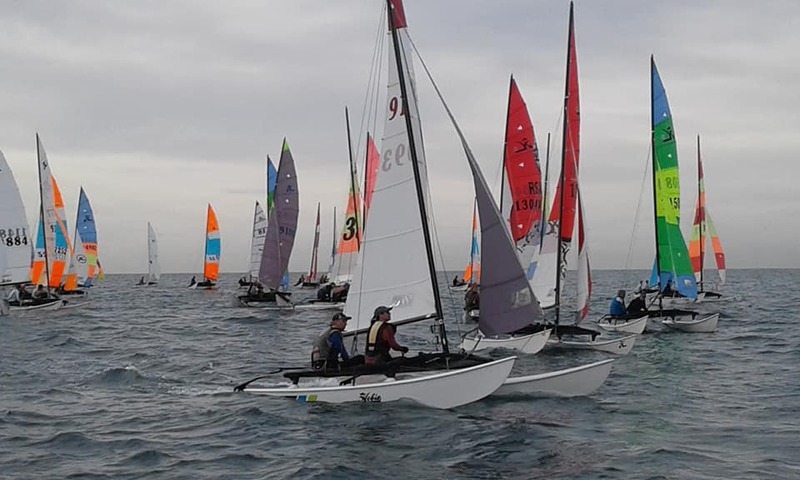 A start of a race in the 2018 Hobie Nationals, with Richard Ayres & Pippa McLaren closest to camera. 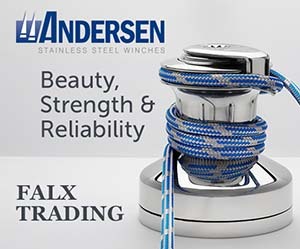 The fleet was then sent ashore for lunch while the wind swung right around to the SW. Three further races were completed in the best (sailing) wind so far – getting up to 14 knots. Race 6 was won by Andrew Boyd & Kim Troll, ahead of team Dodds. Blaine Dodds then got his first win of the series in race 7. Ferry/Pearce were the winners of the final race of the day, ahead of team Dodds. At this stage, Lagesse/Kerford had opened up a lead over the pack, but second place was hotly contested between Ferry and Dodds who were tied on points. On the final day of the Kelston Motors Hobie 16 Nationals, with the forecast for the morning for very light wind, race 9 was set for an 11h00 start. But even that was too early. Eventually a course was able to be set for a 12h45 start in a light easterly. A further postponement was made to permit a bit more wind force and the race could start, still in very light breeze. Fortunately, the strength improved during this race. John Ryall & Nicola Francis and Andrew Boyd & Kim Troll during the 2018 Hobie16 Nationals. Team Dodds had a good initial lead, but were chased down and passed by Lagesse/Kerford. Team Dodds made no mistake in the final race, but Lagesse was down in the pack, Team Edwards got the 2nd place in this race. Race 10 brought in the second discard, putting Blaine & Roxanne Dodds on top of the leader board overall to receive the 2018 Hobie 16 National Champions trophy, Paul Lagesse & Tyran Kerford finished second overall, with Sean Ferry & Lauren Pearce in third place. 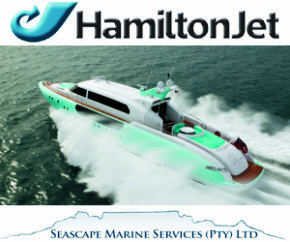 The Hobie class extends it grateful thanks to the Kelston Motor Group for coming in as principal event sponsor. This Group had Hyundai, Peugeot, Mahindra and Volkswagen vehicles on display on the beach front. Thanks also to the many secondary sponsors who helped ensure the success of the event. 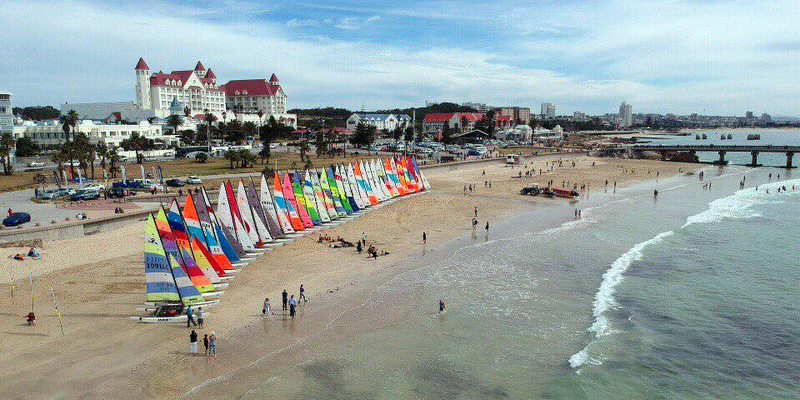 A drone view of the Hobie 16 line up on Hobie Beach, Port Elizabeth.